Timothy Steele is the author of four collections of poems: Uncertainties and Rest (1979),Sapphics against Anger and Other Poems (1986), The Color Wheel (1994), and Toward the Winter Solstice (2006). The first two were reprinted in 1995 as a joint volume, Sapphics and Uncertainties: Poems 1970-1986. He has also published two books of scholarship and literary criticism, Missing Measures: Modern Poetry and the Revolt against Meter (1990) and All the Fun’s in How You Say a Thing: An Explanation of Meter and Versification (1999); and he has edited The Poems of J.V. Cunningham (1997). Steele’s honors include a Wallace Stegner Fellowship in Creative Writing from Stanford University, a Guggenheim Fellowship, a Peter I. B. Lavan Younger Poets Award from the Academy of American Poets, the Los Angeles PEN Center’s Literary Award for Poetry, a California Arts Council Grant, a Commonwealth Club Medal for Poetry, and the Robert Fitzgerald Award for Excellence in the Study of Prosody. Born in Burlington, Vermont, in 1948, he has lived in Los Angeles since 1977. He is an emeritus professor of English at California State University, Los Angeles, where he taught from 1987 to 2012. FOX: Well, I was reading, based on your poem, “Beethoven’s Ninth at the Hollywood Bowl”—apparently at the premiere in 1824, Beethoven insisted on co-conducting, and he was deaf, so he was off. And when it was over, Beethoven was still conducting. So when it ended somebody had to turn him to the audience to accept the accolades because the performance was over. STEELE: Yeah. You may know this, but according to something I read, they realized—I think in 1814—when there was a revival of Fidelio and Beethoven was initially slated to conduct, that it would be a complete catastrophe. Nobody could follow him. Beethoven’s friend and fellow composer Michael Umlauf had to do the actual conducting, as he did later at the premiere of the Ninth Symphony. Everyone treated Beethoven like the master he was, but, as you say, he evidently stood off to the conductor’s side, off to Umlauf’s side, beating time and following the score. FOX: The conductor told the orchestra, “Don’t pay any attention to him!” [both laugh] Okay, well, I’m here on March 3rd, 2012, with Timothy Steele. Your poem “Beethoven’s Ninth at the Hollywood Bowl” caught my eye. Did you write that when you were right there, or afterwards, or did you just make the whole thing up? STEELE: No, I wrote it, if memory serves, the day after. I was newly arrived in Los Angeles and a friend gave me a ticket to the Hollywood Bowl, to the choral symphony, and I thought, “How wonderful; this will be a wonderful initiation to Los Angeles.” And I had no idea that the Hollywood Bowl is roughly the size of Yellowstone Park [Fox laughs], and I was seated way toward the back, and as the epigram indi-cates, it wasn’t a very satisfactory experience. FOX: I totally agree. But since that’s about music, and you’re very big on rhythm and meter, talk about the relationship between music and poetry. STEELE: Well, both, of course, involve rhythm, and organize rhythm. There are obvious differences between the two, but there’s something to the old Greek view that they are very much sister arts. And my own interest in metrical poetry was in part influenced by growing up and loving music, all kinds of music, like Beethoven and Mozart, but also the Beatles and Bob Dylan and things of that nature. So clearly rhythm and the organization of rhythm are essential to both poetry and music, and I think if you have a love for one, it’s likely that you might develop a love for the other. FOX: Yes, I would agree. How do your students react to emphasis on meter and rhythm, which is not, I would imagine, the modern concept? STEELE: They’re curious about it. Most of the courses I teach at Cal State are literature courses. For instance, at the moment I’m teaching a course on New England poets that focuses on Emily Dickinson, Robert Frost, and Richard Wilbur, so I do talk about rhythm and meter. And the students do seem interested in it. It takes them a while to hear it, but they’re certainly receptive to it. Maybe they’re just being nice to me, but a number of students have come up, who have had my classes in earlier years, and said, “Gee, the stuff you taught me about meter and versification has helped me in my course in Chaucer or Milton or Shakespeare.” So it’s knowledge that is easily portable and transferrable to other contexts, and they seem to appreciate that. FOX: Have students changed over the years, since you’ve been teaching? FOX: Well, I used to amuse myself in high school by writing poetry in class because I was bored. Now I guess it’s playing games on the computer. STEELE: Yeah, yeah. One thing one does have to do, or I feel I try to do in teaching, is make sure—particularly for a class that is, say, two hours long—that it’s not text-based the entire way through, that we look at some works of art, or, if we’re doing Apollo and Daphne, hear Handel’s cantata about the myth, or Henry Purcell’s opera about Dido and Aeneas. FOX: So if that’s true, would you decry the end of the age of print? STEELE: I would myself feel very sad, but I don’t know if this is just a personal sadness from someone who grew up with books. And growing up in a cold climate, growing up in Burlington, Vermont, what a comfort books were, just the physical objects; what a pleasure it was to hold them and to read them and to be able to retreat to one’s room in the early evening and be with Charles Dickens or The Wind in the Willows. So I would miss it, but I don’t know if I could universalize that experience. There may be all sorts of gifted and talented young people who will never feel remotely what I feel for the book, and that may not necessarily be their loss at all. FOX: Well, to me, it might be similar to 1480. Before Gutenberg things were done orally and people memorized the Iliad and the Odyssey line for line. STEELE: Yeah, maybe so. The Internet and the Web are partly just exten-sions of the long and ongoing development of telecommunications. And some of the things that are said today about computers, you can go back to Clarence Day’s Life with Father and his comments about the telephone and how that completely changed social life. But at the same time, so far as I can judge, this particular recent phase involving personal computers and the Web really is game-changing. As you say, it’s like Gutenberg’s revolution. I wish I could be around a hundred years from now to see how it plays out. FOX: So, you can’t tell. FOX: In terms of writing poetry with rhyme and meter, is that more difficult than writing free verse? STEELE: Well, it’s hard to say. On the one hand, at least as the concept of non-metrical forms was articulated by Baudelaire in the little preface he did to his Little Poems in Prose, and in certain of the early statements about free verse by Pound and others, there’s nothing more difficult than writing a poem in free verse. You’re trying to write something without meter that nevertheless suggests or achieves the rhythmical organization and focus of a metrical poem. On the other hand, writing toward the end of the twentieth century in an interview I believe withAntaeus magazine, Stanley Kunitz did say the almost total triumph free verse over meter had made poetry easier to write and harder to remember. And because of the widespread adoption of free verse in the twentieth century, it probably became, practically speaking, easier than metered verse, though this doesn’t diminish the theoretical possibilities of the medium. To develop a facility with meter—not just to write in a “rimey-dimey” way, to use Robert Frost’s term—requires time and patience and practice, and in that sense it is a challenge, though it has all sorts of compensatory pleasures, too. FOX: What are the pleasures? STEELE: One is the sense of shaping an experience in a way that indi-vidually satisfies you. Again, I don’t mean to universalize from my experience. Other people may find other ways of doing this. Also, in writing in meter, I find myself exploring ideas and images from different angles and learning more about them than I probably would otherwise, learning things I didn’t know, or didn’t know I knew. When you’re trying to meet the exigency of ten syllables per line or secure a rhyme, you’re obliged to try different kinds of phrasings to see what fits best, to see what is most interesting rhythmically and truest in meaning and yet suits the meter. And so you often find the form, the metrical form, disturbing or unsettling your subconscious in various ways and bringing up different images and ideas from the depths. That can be a lot of fun, and it sometimes is very illuminating, too. I can give you an example. Very early on, I was coming towards the end of a poem about friendship. This was when I was trying, in real life, to make sense of a relationship. And I needed an iambic tetrameter that rhymed on a short “e” and a “d,” and I ended up coming up with a line—it just sort of came to me: “Tact is at once acquired and shed.” And I realized, yeah, that’s what friendship is about. You have to be tactful all the time but tact isn’t something that’s constant. It modulates as you get to know a person better. It would be silly to stand on ceremony with a good friend in a way that you might, say, with someone you’ve just met, yet at the same time you’ve got to always remember that they’re their own person, and if you barge ahead even with the very closest friend, you can hurt them badly if you’re not careful. But somehow, dummkopf that I am, I hadn’t come to that revelation on my own. It was the metrical form that helped me come to it. FOX: It seems to me that friendship is a progression from tact to truth. Tact, I guess, is in part withholding things and in part putting it in a friendly way. Is that something you would agree with? STEELE: Well, yes. I think tact, for me, is more just consideration for the other person. It involves always remembering that the other person really is “other.” I think most of us are, to some extent, solipsists, and that’s because we’re in our own minds so much. It’s really hard to imagine being in another person’s shoes, let alone in another person’s mind. And it’s impossible, too, to entirely know another person’s history or psychic history, even with people you’re closest to, even your spouse. For instance, in my case, I didn’t know my wife for the first 24, 25 years of her life, and even though over time I’ve learned about those years, I just can’t know completely what it felt to her to have her expe-riences—some of them traumatic; her parents divorced when she was only five or six. And so tact is partly just being considerate and partly remembering that there are limits to intimacy—that you can never fully understand anyone else and that it’s probably right or necessary that everybody should be allowed a little distance or privacy from the rest of humanity. FOX: True. What role, if any, does your wife play in your writing? STEELE: She’s a wonderfully intelligent person. I’m in awe of her unfailing resourcefulness and imagination, of her ability to meet any and all problems that come up—and of her sympathy for other people. She has a gift for bringing together people who might like and help each other and who might collaborate happily and successfully. She’s a rare books librarian by training, and now she’s Director for Collections Strategy for the New York Public Library system. It is to her that I first show my poems. I count on her to tell me if something’s working or not. Quite often she’ll zero in on the very line or words I’m concerned about myself. I don’t usually share poems with others until I believe the poems are finished, so Vicki’s early readings are important to me. FOX: Do you ever censor yourself for fear of revealing too much or talking about someone else in a way they might not like? FOX: Does the poem you’re writing ever say to you, “Don’t wanna rhyme”? Just “don’t wanna rhyme”? STEELE: Yeah, it does. Certainly, some kinds of narrative poems do, though there I go into blank verse; I tend, as you know, to write poetry in meter pretty much all the time. I did, I should say, as a younger poet, write in all sorts of forms, and in the first couple of books, there are a couple of free verse poems and some poems in syllabics. But—I was thinking of this this morning—it seemed to me at a certain point that it might be useful to just do meter because so few other people of my generation were doing it. STEELE: So it might be useful to just do that. FOX: How does the poetry world respond to your writing and your style? STEELE: It’s been mixed. I think responses to one’s work are, to use John Updike’s wonderful phrase, “inexorably mixed.” You’re always going to get some good response, some favorable response, and some unfavorable response. There have been, I think, at times, certain responses that have been dogmatic, in terms of being against the metrical element in my poetry. Some people just feel that this is some-thing old-fashioned, that one shouldn’t do it. And one canard, as you may know, that’s circulated against metered verse—and is terribly misleading, I think—is that there’s something socially or politically conservative about metered poetry. FOX: I wouldn’t think so. STEELE: No, particularly when you think about some of the great pioneers of free verse like Pound and T.S. Eliot and Percy Wyndham Lewis and even D. H. Lawrence. They were quite conservative—and in the case of Pound and Wyndham Lewis, Mussolini-Hitler conservative. 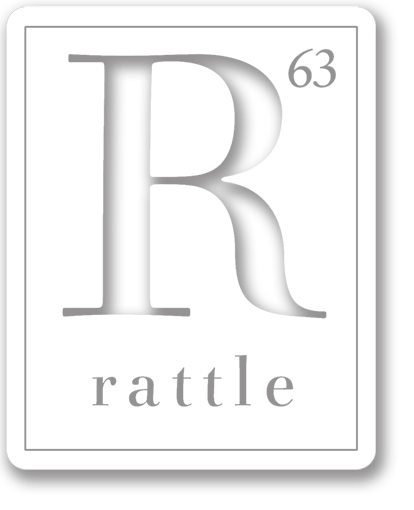 FOX: At Rattle, we get a number of rhymed poems, most of which are awful. Just awful. Although, to my surprise, we took a … nineteen-page rhymed poem? STEELE: Yeah, absolutely. And the trick is—I think Frost says some-where, maybe in a letter to his friend John Bartlett—you need for the verse to break the singsong, to break the doggerel, but not break with it or away from it. You want to maintain the meter, the general metrical pattern, but you also want to modulate it internally in particular and different ways so that it has life. The trick of writing metered verse is that you have on the one hand this analytic abstraction, this meter, and on the other hand you have the living rhythms of actual speech. And you want them to harmonize so that the living rhythms of speech bring the meter, the analytic abstraction, to life, while, at the same time, the analytic abstraction, the meter, gives the fluid natural speech a memo-rable shape and form. You want to get those things working together. FOX: Do you ever feel that you sacrifice a little accuracy and the exact right word because you have to go for the rhyme? STEELE: I don’t feel that. Usually in my case I feel, as I indicated earlier, that the form helps me to get to le mot juste. When I feel that the form and what I want to express are at loggerheads, I usually step back and try a different approach—say, try to write in a different meter, or set the poem aside for a while. I feel if I’m patient enough I will be able to find just the right word within the form, but I need to be patient. When expression and form aren’t harmonizing, I’ve often found that it’s not so much a technical problem, it’s that I haven’t intellectually, emotion-ally, come to grips with the subject as fully or accurately as I could have. FOX: Have you used a thesaurus to find the right word? STEELE: No, I haven’t, and, perhaps more to the point, I tend to avoid also rhyming dictionaries. I do sometimes go through, when I need a rhyme for, I don’t know what … say, “floor” … I go through, “bore, door, galore …” But I try to keep as close as I can to the process and to testing sounds and to making sure the sounds are suggestions from my ear rather than from an outside source. Because it’s your poem that you’re writing, the more you can keep it in your idiom, I think the better off you generally are. If you start to graft outside things on, it tends not to work. FOX: What’s the normal life of a poem that you write? In other words, do you sit down one morning, write the poem and it’s done, or do you sit and write and put it aside—how does it work? STEELE: When I was younger sometimes poems would come to me at a sitting. There’s one from my first book with, I fear, a rather pretentious title, “Profils Perdus,” that came to me in about twenty minutes. I’d been thinking about the theme of the poem for some time, but the actual writing came quickly. And there were several other poems early on that were written that way. Now I tend to write slowly, stanza by stanza. Sometimes I’ll write a poem continuously over a week or so, getting up early in the morning—I tend to be a morning person in terms of writing. And I’ll write for an hour or two each morning for a week or two and then have the poem. But other times, and particularly for longer poems, I may write over it a long period of time, write part of it and set it aside, or write it and then decide there’s something that’s not very good and try to write it again from another angle—sort of knock it apart and put it back together in a different way. FOX: Do you write very many poems that after a while you decide, “This isn’t particularly good and I don’t know how to fix it and I’ll just call in something else”? FOX: Well, I think less experienced writers—we read the finished product, we read the poems that you’ve worked on, that you liked the best, that you’re willing to put in a book, and we think that, you know, when I write a poem it’s going to be that good, first draft, which is not possible generally. STEELE: Yeah, it’s not. I think in this regard sometimes studying a favorite poet is fun and beneficial. You learn, for instance, that Thomas Hardy—he seemed to me, at least as a student, a very natural, musical, free-flowing, inventive poet—worked incredibly hard on his poems. Even after he published them, from one volume of Collected Poems to another, he would keep revising. And he made them better; with each revision they did get better, and they were good to begin with. There are other cases—I don’t know if it’s in Jon Stallworthy’s biography, but it’s one of the most heartfelt poems I ever encountered—it may have been in a Louis Untermeyer anthology when I was in high school—I remember being struck by Wilfred Owen’s “Anthem for the Doomed Youth.” The poem seems like a pure, spontaneous outpouring of grief for the slaughter of all the young men in the trenches in World War I. But then you look at the drafts—and the poem went through multiple drafts—and you see how much Owen changed the poem in the course of writing it. The general sonnet form is suggested from the beginning, though the poem is mostly unrhymed in the early going. And then partly with the encouragement and suggestions of his friend and fellow poet Siegfried Sassoon, he changes the wording and the images from draft to draft, improving things bit by bit, until the great poem we have emerges. FOX: How important is the title to you? FOX: That’s a good point. What do you enjoy most about being a poet? STEELE: I suppose writing. That might seem a redundant or obvious answer, but I enjoy writing. I enjoy the process of trying to give some-thing that has arrested me, or something that I love, stability and, I hope, lasting shape. Much of what I write about is written out of a desire to preserve something that seems important, an idea or an image or an experience. FOX: So, growing up in New England, how did you end up in Los Angeles? STEELE: Well, I went to elementary school and high school in Burlington, Vermont, but there was a friend of my mom and dad’s in Middlebury, a fellow named Walter Bogart, who taught in the Political Science Department at Middlebury College. One afternoon while my mother and I were visiting him—this was sometime when I was in high school—he asked, “Where are you going to college?” And I said I didn’t know, and Walter had taught for a time at Stanford, and thought highly of the school, and recommended it. I remember he said very seriously, “You know, you should get out of New England for a while.” He wasn’t putting New England down, but he thought that the region could be a little insular. I already knew about Stanford since my mother, brother, sister, and I had visited Palo Alto during a cross-country camping trip in the summer of 1964. So I ended up going there. Then between my junior and senior year, my mother remarried a wonderful fellow, a biochemist, and they went down to Cali, Colombia, where he taught at the medical school at the state university. He was on a Rockefeller Foundation grant, I think, and they stayed there for about seven years. My brother, sister, and I were glad for our mother. She had guided us as a single working parent through our early years and off to college, and she deserved a chance for personal happiness and new experiences for herself. However, during that period, when she and her husband were in South America, and when the family center had been displaced out of Vermont, California sort of became my home. I started putting down roots out here. My friends were increasingly out here. Then when I came to Los Angeles in 1977, I met my wife-to-be, Vicki, and she’s an Angelino, so I ended up staying here. FOX: Does she have to spend much time in New York? STEELE: It’s a high-level position she has at the New York Public Library, and she’s living there. But she comes home as often as possible, and I go to New York. We’re in touch by phone and email every day. We’ve been happily married for more than 30 years, so we’ve been able to manage the situation pretty well, though I miss her when we’re apart. FOX: What part of your education, formal or not formal, do you feel is the most important to you in your life? STEELE: Well, I think the early education. Poetry has become what’s most important to me in my life other than my family and friends. I think a big reason for this was encountering—and I didn’t know this at the time—encountering good literature, good poetry, at an early age. In this sense, probably the seminal experience was being read to by my mother as a little boy—Mother Goose’s Nursery Rhymes, Stevenson’s Child’s Garden of Verses, Dr. Seuss’s Cat in the Hat, Edward Lear’s Owl and the Pussycat, things of this nature. And being fortunate—again, I didn’t appreciate this at the time—in being exposed in elementary school to the poetry of Frost, who was at that time still living down Route 7 from Burlington in Ripton. And every summer the University of Vermont in Burlington had an excellent Shakespeare Festival. Those early experiences were the formative ones. FOX: Did you ever meet Frost or see him in person? STEELE: I did not. I’ve met friends of his and his granddaughter, Lesley, but I was too young and too naïve to think of that at the time. I have some dim memory that he gave a reading when I was in sixth or seventh grade at Ira Allen Chapel, up on the hill overlooking Burlington, at the University of Vermont, and I have a vague memory that my mother said something to the effect of, “Well, we’ve gone up and heard Harry Belafonte there and Pete Seeger there, would you like to go hear Robert Frost?” But I think my friends and I were doing something then. I don’t know, but if this opportunity really occurred, if this really happened—memory is the mother of mythology, as J. V Cunningham says—I blew it. FOX: How many readings do you do in a normal year? STEELE: Maybe five or six. I read last Sunday at the public library out in Claremont and there’s a convention of critics and literary scholars, oddly enough, also out at Claremont/Pomona this coming week, and I’ll be reading there on Friday evening with Pete Fairchild and Bob Mezey. And I’ll do a reading at a conference in Philadelphia in June. FOX: What do you enjoy most about readings? STEELE: I most enjoy reading new work and finding out how it sounds. I try to read poems aloud as I’m writing them. I don’t want to end up writing poems that are rhetorically impeded or clotted; I want to write poems that I can speak normally and comfortably, and to try to do that before an audience is a good test. FOX: What have you written that’s given you the biggest surprise? STEELE: That’s a good question. There are so many surprises and so many things that I would never have anticipated writing. Sometimes when I write—I don’t know if this is a case of being surprised—I’ll say, “Is there a kind of poem that people aren’t writing that I could write?” I have a great colleague and friend at Cal State, Ruben Quintero, and he asked me to write an essay for an anthology of essays he was doing on satire—he asked me to cover twentieth century verse satire—and writing the essay, I thought, “You know, poets in my generation have written lots of poems that address political issues, but there’s not been much political poetry of the Jonathan Swift, John Dryden sort—not much poetry that is political in the extra-personal sense.” And I ended up writing a poem about something that I felt strongly about—that many of us feel strongly about—this idea that in modern warfare collat-eral damage is okay or inevitable. But I tried to remove myself and my feelings from the poem in hopes that a more comprehensive voice of history would speak through me. I had in the back of my mind that blood-curdling book on “total war” by Erich von Ludendorff. As you know, von Ludendorff had been one of the leading German generals in World War I. He was an early supporter of Hitler, and his ideas influ-enced Hitler’s strategy of bombing civilian centers at the end of the Spanish Civil War and in the early years of World War II. And the poem took as its beginning the bombing of the Basques in 1937 and looked at the way that event prefigured policies that both sides adopted in World War II and that were carried through to the saturation bombing of Dresden and the atomic bomb. That was a poem that wasn’t in my normal wheelhouse, but I thought, “Well, let’s see if I can do it.” So I did that. I don’t know if the poem is successful or not. FOX: No, I liked it. I also just take it for granted that in war you kill civilians—I mean bombs and blah blah; I assume that that’s always been the case. Your poem is telling me it started in 1937. STEELE: You make a good point because, yeah, there have always been atrocities in war and civilians have always suffered, but the twentieth century was the first century in which civilian casualties in war far outnumbered military casualties. Some authorities believe that over 50 million non-combatants perished during World War II alone. One reason for this was the development of modern military aircraft, which could project power in unprecedented ways. If you were Xerxes or Napoleon and wanted to sock it to Greece or Russia, you had to muster huge armies and slog over long stretches of difficult terrain with heavy equipment. But with modern planes and explosives, you could wreak terrifying devastation deep behind enemy lines in a matter of hours. Even though people now apply the term “total war” to earlier wars or campaigns like Sherman’s march from Atlanta to the sea, von Ludendorff was the guy who coined the term for his book in 1935. He was the one who argued that modern warfare not only requires the total mobilization of societies, but also demands utter ruthlessness in deploying air power against the civilian population of the enemy and submarine power against its shipping. He explicitly dismisses as “a pious wish” proscriptions against bombing civilian populations and sinking non-military vessels. Once this idea is established, a six-month-old baby from a belligerent nation is as fair game as the guy with a rifle on the front lines. FOX: Where do you find beauty in your life? STEELE: In nature, in concerts. I recently went, last Friday, to Disney hall and saw Charles Dutoit conduct Stravinsky and Debussy and Prokofiev. Life can be heartbreaking, but there is so much beauty. I have a stocking feeder outside the kitchen window and can watch the goldfinches come and eat in the morning. And I can turn on KUSC and can hear Angela Hewitt playing Bach. FOX: Yeah, pretty good. Tim? GREEN: I’m just wondering what you think about the future of poetry. It seems to me like recently there’s been kind of a counter-revolution of metrical verse that’s taken hold a little bit—maybe Poetry magazine is one of the reasons for that, publishing a lot more meter lately, but if you look at a lot of journals you see more metrical verse than a few years ago. Where do you think poetry’s headed? Do you think metrical verse is fighting back and will become the more popular or do you think free verse is going to hold on? STEELE: I think free verse will hold on. My own feeling is—I’ve tried to say this in my critical work—I have no objection on principle to free verse. What I have been concerned about is the notion that free verse has somehow supplanted metrical poetry. I think free verse is a form additional to metrical poetry, and my sense is that free verse will continue. But I hope metrical verse will continue, too. They’re just different forms of poetry. Free verse by now certainly has its own tradi-tion, and of course it’s particularly strong in the United States, with one of our founding poets being Walt Whitman, though it’s hard to know exactly how he would’ve characterized his poetry, since “free verse” as a term comes later. But looking at Whitman and Pound and Eliot and Williams and Olson and so forth, it’s a tradition that’s now at least 150 years old. So I think both free verse and metered verse will continue, and I hope both do continue.